Home / News / IPOB Threatens Bloodshed If President Buhari Doesn’t Keep Off Biafraland! IPOB Threatens Bloodshed If President Buhari Doesn’t Keep Off Biafraland! Stay away from Ani Igbo (Igbo Land), The Indigenous People of Biafra (IPOB) orders President Muhammadu Buhari else there will be bloodshed. President of Nigeria, Muhammadu Buhari is scheduled to visit Ebonyi state on Tuesday, and Anambra the day after ahead of the governorship elections holding this Saturday. “We (IPOB members) will die with him should he set his foot on the sacred land of Biafra,” spokesperson of the group, Emma Powerful, told The Cable. “Tuesday November 14th 2017 will be recorded in history as a very bloody day should that Jubril masquerading as Buhari attempt to land on Biafran soil,”. The governor of Ebonyi State, Dave Umahi, visited the presidential villa last week where he told state house correspondents that the people of the state were “fully prepared” to receive the president. “There are quite a lot of projects that we have executed within these past two and the half years. We have three twin flyovers that are built across the African Tran Sahara Road running from Enugu to Cameroon passing through Ebonyi state, so we have to build three twin flyovers to decongest traffic on that road, each of the twin flyovers is 700-metre length,” Umahi was quoted as saying. 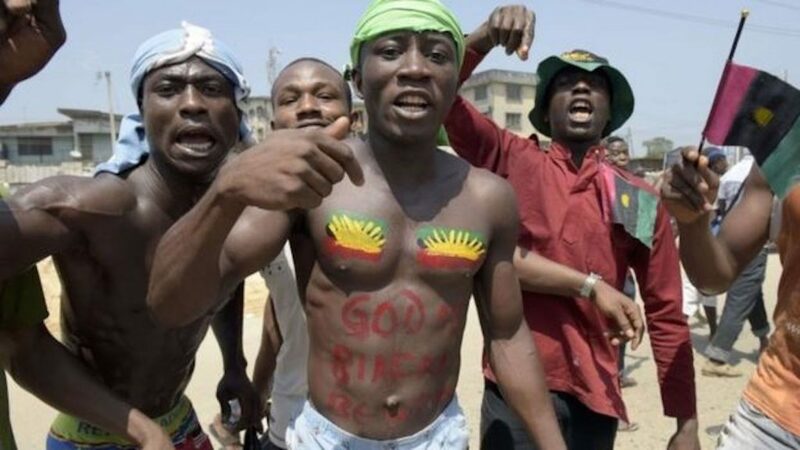 The Indigenous People of Biafra have repeatedly called for the boycott of the Saturday elections calling instead for a referendum for the actualization of Biafra. Coupled with police personnel, the military has readied itself to intervene in the polls on Saturday should there be any outbreak of violence although IPOB has insisted that it has no intention of causing any mayhem. Yesterday, a governorship debate was held on the Channels TV platform among four of the contestants. IPOB leader, Nnamdi Kanu’s whereabouts are still unknown. He was last seen in his hometown during a sting operation by the Operation Python Dance troops in the Southeast.